I love this design by our friend Peter Moller, making one think of an ancient copy of King Lear, complete with finger smudges! 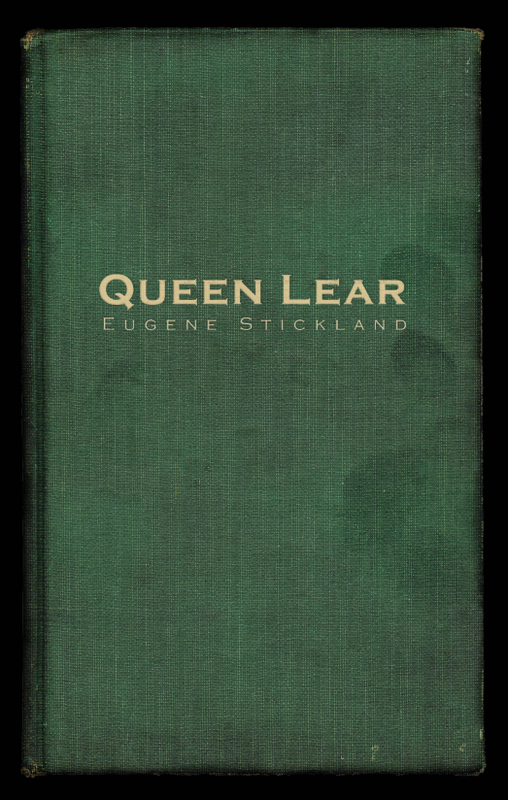 The publication of my play Queen Lear through Blurb.com. I have written about the current reality of the publishing world on this blog before but at the risk of repeating myself, here are some thoughts about where I feel things stand right now. Right now being on a Sunday morning in mid-October. A mild autumn day in Calgary, Alberta, Canada. I should preface this post by repeating something I said in an earlier post, that if someone tells you they know what’s going on in the publishing world these days, turn and run the other way. They are lying to you. No one knows. All we know for sure is that things are in a state of flux. I have also mentioned in an earlier post, but it bears repeating now, that I have four books published by, one could say, traditional publishing houses (Coteau, Red Deer College Press and Broadview). While I believe I was paid a reasonable amount from Coteau, as far as I can remember, I have only received one royalty cheque in my almost twenty years from Red Deer, and that was for $16.00. Broadview sends me royalty statements informing me that I am in a never-ending negative position with them. They figure I owe them some $160.00 after 12 years with two of my books in their catalog. Who am I to argue? Of course, until now I have published only plays, and one could say that plays don’t really sell all that well. The greatest possible benefit for the author is that their publication increases the likelihood of more productions. What the benefit is for the publisher, I couldn’t really say. But listen to this. My play, my old chestnut, Some Assembly Required, was published by Coteau Books in Regina, my home town, in 1995 and was a finalist for the Governor General’s Award. The book sold out its run, but they decided not to reprint it and declined the opportunity to publish subsequent plays of mine. It was like I had done something wrong. So, you can well imagine that when my friend Michael J. Finner approached me with the idea of starting a publishing company of our own, I was all ears. What did I have to lose? On a cold day in early January, 2008 we met and created B House Publications, with the soon to be realized goal of having my play Writer’s Block as our first publication – for sale in the lobby on opening night. The problem that arose is that I am only one person and can only spread myself so thin. I love the process of meeting with fellow authors and even editing their work and helping get it into book form. After that, in terms of marketing and distribution, I admit I am essentially useless and have let all of these authors down. There just aren’t enough hours in a day. Until now, we have had our books, usually designed by the amazing Peter Moller, printed with a local company, Blitz Print in Calgary. They do very fine work and are reasonably priced if you’re thinking of printing a book in Calgary. Someone would then end up with boxes of books in his or her closet, the idea being to sell these, becoming rich and famous during the process. In the early days, we had high hopes that these books would be sold here and afar, but because we never had any marketing support (let alone a plan for distribution) the books and the big dreams only went so far. Many a time I felt so overwhelmed that I just wanted to abandon the entire project. But then a poet or playwright would approach me with a book idea and I just couldn’t say no. And so we have limped on. I love books and the chance to bring a new book into the world has always been too compelling not to do it. For the last few years, B House has essentially been an opportunity for self-publishing but with our logo on the cover. Our writers have kept 100% of the royalties. I have spent thousand of hours on B House business and would hate to calculate what that has worked out to as an hourly wage. Meager comes to mind. But I’ve also been driven by the fact that because we don’t know the future of publishing, it wasn’t a bad idea to keep this thing alive. You just never know. I honestly don’t know what the future holds, where this might lead, if anywhere, but it just made sense to try against all odds to keep the enterprise afloat. I’ve had orders for the book over the last few years, but I just couldn’t see the point of continuing on with our same model. I really didn’t want to order 100 copies, sell ten, and then have those remaining 90 copies taking up space in my office. Boxes of unsold books cause their own kind of anxiety, let me tell you, quite unlike anything else. This summer I heard about Blurb.com, which I suppose one could best describe as a virtual publisher. They create your book only when an order is placed for it, from one to – well, the sky’s the limit, I suppose. The information on the book and the mechanism for ordering sits on their website (blurb.com or blurb.ca) and so I can promote it, in blogs like this for example, and any way I see fit. But I don’t really have to worry about it after that. This finally offered B House some relief on the distribution side of things. And so, after some research and growing pains, we finally got the reprint of Queen Lear up and available through Blurb. Through Blurb, I am able to establish my own royalty which I don’t share with a publishing company. I set it myself and know exactly what I will make per book. If the total exceeds $25.00 in a month, it is deposited in a Pay Pal account for me. Simple. And effective. At the same time, I can order copies of my own book at cost price and sell these in bookstores that I promote, in this case Calgary’s Shelf Life Books. And any other that would bother to ask me. My goal here is not to circumvent booksellers. Only publishers. Is this the future of publishing? Could it the end of conventional publishing as we know it? We have seen the demise of newspapers – I lost a good job when the Calgary Herald was in danger of going into the dumpster a few years ago. Is there any reason to think the same thing won’t happen with publishing houses? Time will tell, I suppose. Despite what it might seem, I don’t wish any of them any ill fortune. I’m guess I’m old school, but I believe we need books and readers of books to salvage and maintain what’s left of our faltering civilization. Hopefully there is room for all of us, big and small. Or, as we like to say at B House, not small but boutique. I’ll tell you something. Things are changing and I embrace the change. I welcome it. And I’m curious to see where this all ends up. Here’s a performance by a man who wrote a great book, his autobiography. Amazing how he keeps going strong after all these years. . .